Modern bathtubs have just about everything you would need to enjoy comfort, luxury, and relaxation in the tranquility of your own home. 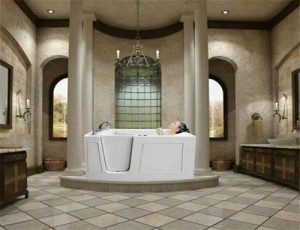 But, for seniors and those with limited mobility, most bathtubs on the market today have one thing missing: the ability to get in and out of it without having to lift yourself into or step down into it. For those with health issues or mobility limitations, this can introduce risk of injury, or worse. There is a better way. Introducing Perfect Walk-In Bath Tubs, the perfect addition to any bathroom where ease of use and safety are top priorities. A San Diego walk-in bathtub is specially designed for seniors or people with physical conditions that make using traditional bathtubs challenging or even dangerous. These walk-in bathtubs in San Diego are beautifully crafted to provide safety, convenience, and functionality as good as or even better than traditional bathtubs. Waiting to draw a bath is a thing of the past with all of our San Diego walk-in bathtubs. 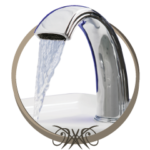 Our high capacity faucets deliver 18 gallons of hot water per minute at 60 psi. This allows your walk-in bathtub in San Diego to fill up in as little as 4-6 minutes! In addition, these high capacity faucets also include an extendable hand shower that allows total freedom during bathing time. These faucets are also available in upgraded color packages. 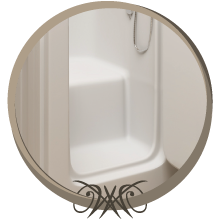 Due to the nature of a walk-in bathtub in San Diego, users must rely on fast draining in order to exit the bathtub without spilling water. 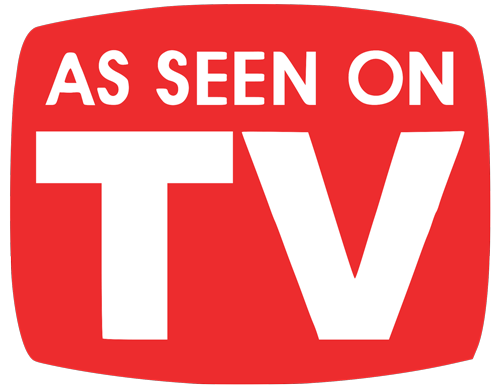 Our Safe-T Drain™ is specially designed to drain your San Diego walk-in bathtub in as little as 85 seconds! This specialty drain meets or exceeds all plumbing codes in your area and is certified to work as advertised. All of our San Diego walk-in bathtubs can be customized to your specifications. 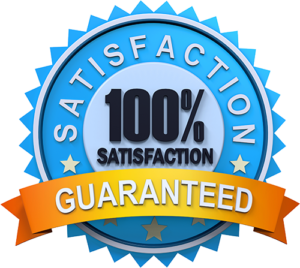 While we have standard models available, we understand that every one of our customers have unique needs and it is our mission to meet those needs wherever and whenever we can. One area we can customize for you is jet placement. 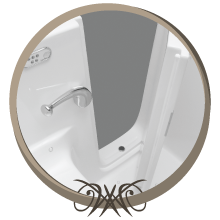 With help from our highly specialized walk-in bathtub specialists, we can help you design a custom jet setup that is perfect for your unique needs. Every San Diego walk-in bathtub that we sell comes with a standard angled support (grab) bar, perfectly installed where you need it most. For those customers who need additional support features, our walk-in bathtubs in San Diego can be fitted with additional grab bars wherever they may be needed. No San Diego walk-in bathtub can truly be accessible without a seat perfectly situated to allow for easy use and safe functionality. Our 17” walk-in bathtub seat is ADA compliant and allows you to enter and use your walk-in bathtub safely and securely. This seat will help to reduce the risk of falling while also situating the user for maximum comfort. These door latches have been designed to be operated flawlessly and easily. 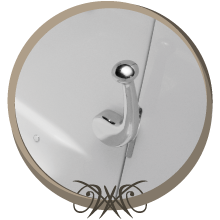 This allows users to know with confidence that their San Diego walk-in bathtub door has been closed securely and will open easily and effortlessly. All walk-in bathtubs in San Diego must be fitted with a certified door drain to ensure safety when users enter and exit their walk-in bathtubs. 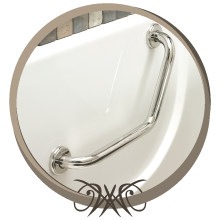 All of our San Diego walk-in bathtubs feature a federally certified door drain. 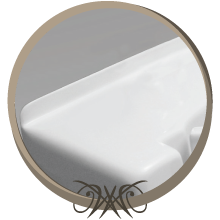 When our walk-in bathtubs are properly installed, this tile flange water barrier will prevent water from leaking behind the San Diego walk-in bathtub and causing damage. If you are replacing your standard 60” bathtub with one of our San Diego walk-in bathtubs, it may be necessary for you to fill in the gap with an extension panel. 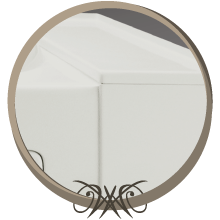 This addition will preserve the aesthetics of your bathroom. Heated Backrest – keep warm while waiting for your San Diego walk-in bathtub to fill or drain. 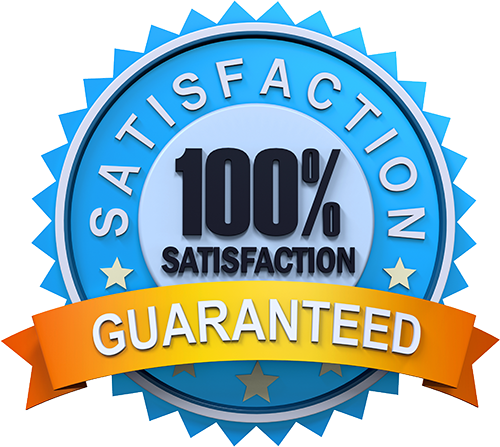 UV Sanitization – kills bacteria, viruses, algae, mold, yeasts and other microorganisms. 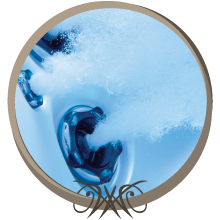 Ozone Sanitation – sanitizes the air you breathe by killing disease causing microorganisms. Aromatherapy – experience the scent of wave splashed beaches or tropical rain forests while you enjoy the soothing jets of your San Diego walk-in bathtub. Chromatherapy – light therapy will enhance the ambiance of your bathing experience by helping to reduce the stresses of day-to-day life. These lighting effects feature over 20 colors to choose from. Hand Held Shower Slide Bar – fully adjustable and perfect for those users who have limited mobility. This slide bar allows bathers to place their shower head at the perfect height. 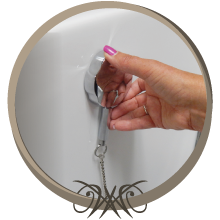 Custom Shower Rod & Curtain – when you install a custom shower rod and curtain with your walk-in bathtub in San Diego, you will bathe in privacy and keep water from splashing onto the floor outside of your bathtub. This helps you to avoid dangerous slips and falls. This shower curtain and rod combo is easy to use and compliments your bathroom aesthetics. Wall Kits – finally, add that finishing touch to your bathroom by seamlessly blending your San Diego walk-in bathtub with your bathroom interior design. These wall kits will transform your bathing area into a beautiful environment and are available in four attractive designs – white, Breccia Paradiso, Mocha Travertine, and Botticino Cream.